I'm also 185 and I was an intermediate when I switched to the Slingshot 633 with 91cm mast. Previously I was riding the Lift 110. I can't comment on the 170 Fish - but a few(3) HR locals are riding the Lift 170 and love it. Come to the ES and look for them - they ride blue Doyle boards and drive Sprinter conversion vans. The SS 633 is amazing - carving turns on swell and footswitch transitions improved 100% in one week. It gets even better if you pair it with a smaller pocket board like the 3'6" Dwarfcraft or Kanaha Shapes. I am also 185, and a huge GW 91 fan. Just get the GW 91 if you foil in swell, vs flat water. Flat water? Then I'd go with the GW 101 (590 wing), or Lift 110. I can keep up with my buddies on faster wings--590/Lift 110--in any kind of swell as we head upwind into chop/swell, because the 633 has amazing stability. The exception being race wings mounted to long masts--111. You don't have to worry about ventilating, or sudden altitude changes. Downwind, I am able to go much slower, and play on the swell faces, vs outrun all of the fun stuff. Speaking of overweight kiteboarding, you might discuss your dilema with Stringy. Disclaimer: a few people have bought the 633 and did not like it. IMO - they should ride it for 5 sessions before forming a love/hate opinion. It has a lot of lift and requires some adjustment to mast placement, weight distribution, and possibly shimming. If you want to demo and you're near HR - contact me via PM. You're welcome to try mine. I'm loving my 590 & 101 GW mast. Moses rocks! The 590 has set my progression at a new level immediately. Didn't have a chance to try the 633 as it will not bolt onto the 2017 GW fuselage. You guys are killing me! First of all your generosity IDHR for offering a demo! Thank you! And from the competing arguments! I live in Coeur d'Alene and am leaving for the east coast for a month or two in about 10 days, at which point I would really like a new foil setup with me. If I don't make it to Hood River in the next 10 days, demoing will will probably not be possible and I will have to roll the proverbial dice. Know you cannot answer this for me but do I simply go with the 150, which is the only setup of the group that I actually rode but loved? Do I go with the 633 which most are raving about but some are not? Do I go with a seemingly awesome retailer who seems to have no hidden agenda, as he has both the 633 and Lift 200 available and even though the 633 is more money and he disclosed some of the Lift issues with me right up front, is still believing that I will love the 200 more than the 633 as he does? Then there is the 170 LOL! Oh the agony of such stupid problems! I hear you. Folks tend to promote what they know. The good news is I don’t think you can make a bad choice. In fact, you can’t make a bad choice. Every wing discussed is going to be excellent. Most important, think about how you like to ride and where you ride. If there is steep, or steepish well formed swell I think bigger surf wings are more fun: 633/170/200. The designer of the 590/633 wings, Tony Logosz, really encouraged me to get the 633. He knows my style and the skills I wanted to learn as quickly as possible. 633 ended up being a grand slam. I have a 590 too mounted in its own fuse. At some point I want to see how quickly my 633 skills will transfer to the faster, less stable, higher stall speed wing. But honestly, it’s more of an exercise in “I wonder how well I can,” rather than wishing I was on a faster wing. It’s hard not to look at Fred, Tak, Cinbad on their 590’s and want to ride what, and how they ride. But, these are some of the very top foilers in the PNW and beyond. Me? I am all about buying some technique to help learn some of this stuff. The extra speed and looseness holds me back. It’s less fun. None of this is helpful re 170/200/633, however. That said, I bet you’ll love anyone of them. I've talked to one person who owns the 170 and 200. The 200 is comically slow and draggy and not much fun for kite foiling. It's better for SUP or paddle surfing. If you loved the 150..... I'm wondering why you don't go for that? Will you be foiling in a bay with flat water/choppy conditions or trying to go out in the open ocean with waves? Ha! Welcome to the tribe! Be sure to pair that wing with a board with a mast track that's far enough back. The center of lift on the 633 is far forward due to its size, and the fact that it comes with a long fuselage. I can tell you that it works great with the SMALL Dwarfcraft (3'6"), as the track is close to the tail. On the larger DC's, the track is too far forward to work without shims. I think the 633 will also work well with the AlienAir, as you have more room towards the nose to play with--LDHR can comment on that, I believe. Yeeha!! 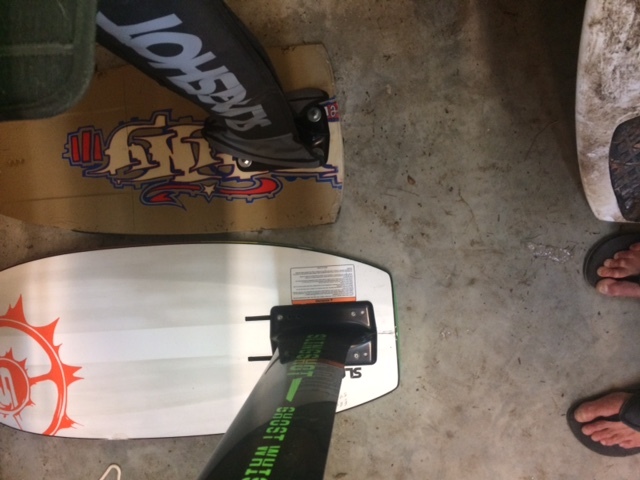 Since I will also be using this setup in lighter wind conditions I was told the 4’8” LF Galaxy is a sweet board. They are pretty much sold out but found the last one at Real. Might this board not be right for this setup? I can always change my mind. It's all about how close the rear of the track is to the rear of the board, how long the board is, and do you use straps/hooks? As a point of reference, given a board setup with a 590, or Lift 110, the 633 will need to move 5 cm back--towards the tail--from that. Call them up and get them to pull a measurement from the REAR of the mast track to the farthest forward center hole. If you are okay using a single front hook that gives you more room to shift forward. If you ride strapless you get even more. This measurement on my 3'6" Dwarfcraft is 30", and feels perfect for me at 6'3" tall without a shim. Eric, Will you be anywhere during the Labor Day Weekend where I could see you on the water? Maybe we could trade boards mid-river so I can experience the 633. I'm on my 590 w/ Kanaha Shapes 37. I gotta decide before driving south into Mexico for 6 months. A place where there's no delivery of shiny new toys. Heading to anywhere from Roosevelt to Ft Stevens for Labor Day.